In the UK and Germany the cars ('First Prize') will be delivered with UK or German VAT paid respectively. In all other countries the First Prize will be delivered with a maximum of 20% VAT paid but any further costs (VAT/taxes/import duties/registration costs due in the destination/country of final registration) will be the responsibility of the First Prize winner. The First Prize winner will be required to send a copy of their passport to Lottoland to confirm their identity, age and also to prove that if the purchase was made by credit card that the card was legally theirs or that they had authorisation to use it, before any prize will be paid or delivered. Any failure to meet these obligations may result in the First Prize winner being disqualified. Following receipt and verification of the details requested above by Lottoland, the First Prize winner will be contacted in order to make arrangements for delivery of the prize. Lottoland cannot guarantee delivery within a certain timeframe. 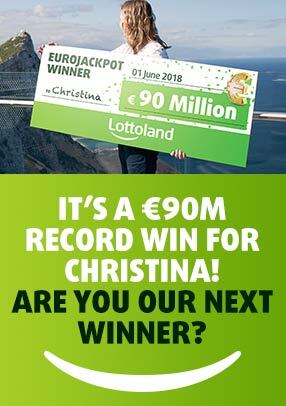 If possible Lottoland will take into account First Prize winner's requests in terms of colour schemes of the cars, but we cannot guarantee all requests can be facilitated. If due to circumstances beyond Lottoland's control, we are unable to provide the stated First Prize, we reserve the right to award a selection of substitute Left and Right Hand Drive cars of equal or greater value. Cash Alternative: As an alternative to physically deliver the First Prize, Lottoland can at its sole discretion settle in cash („Cash Alternative“). All First Prize winners will be required to provide photographs and/or pose for photographs and videos, which may be used in future marketing and public relations by the Promoter in connection with the Competition and in identifying them as a winner of a Competition. Lottolands' General Terms & Conditions apply. This offer can be redeemed multiple times. Players that bet on 2 x EuroMillions Double Jackpot lines will receive a €2 discount. Offer starts at 10:00 GMT Tuesday 7th February 2017. Offer expires at 19:30 GMT Tuesday 7th February 2017. Bonus will automatically be applied in checkout section and it is the player's responsibility to check their shopping cart before confirming the transaction. Players that stake €10+ on the EuroMillions Instant Win game will receive 10 FREE GAMES on the game Mega Love on Tuesday 14th February. Free Spins will be confirmed via email on Tuesday 14th February, no later than 6pm. Offer starts at 12:00 CET Sunday 12th February 2017. Offer expires at 23:59 CET Monday 13th February 2017. Players that stake €10+ on the EuroMillions Instant Win game will receive 10 FREE SPINS on the game Mega Love on Tuesday 14th February. Offer starts at 12:00 GMT Sunday 12th February 2017. Offer expires at 23:59 GMT Monday 13th February 2017. The Bitcoin Scratch top prize is based on the result of the Bitcoin Scratch card. The Bitcoin Scratch costs 1 EUR (or currency equivalent) to play. The top tier prize for the Bitcoin Scratch is valued at €150,000 (or currency equivalent), upon winning the top prize this amount will automatically be credited to your account. If you are lucky enough to win the top prize you have the option, at your election, to take the cash equivalent or to convert your prize into 10 Bitcoins. The cash equivalent will be capped at €150,000 (or currency equivalent). Should you elect to convert the prize to 10 Bitcoins, the full €150,000 (or currency equivalent) will be removed from your account and 10 Bitcoins will be paid into your Bitcoin wallet. Should the value of 10 Bitcoins exceed €150,000 (or currency equivalent) at the time of winning (valuation will be based on the value of a bitcoin as displayed at 9:30 pm (Central European Time) on the day of the winning purchase as shown on https://www.coinbase.com/charts), you will still be credited 10 Bitcoins. Should the value of 10 Bitcoins be less than €150,000 (or currency equivalent) at the time of winning, any excess cash amount will be forfeit. Should you choose to take the 10 Bitcoins, please contact customer services with your request quoting your account number. Due to the volatile nature of the Bitcoin cryptocurrency, we reserve the right to adjust the product on an on-going basis to keep it relevant with Bitcoin value. Lottoland reserves the right to amend the price per bet at any point for whatever reason. Lottoland reserves the right to amend or withdraw this product at any point for whatever reason. All players who spin in the participating game (Rainbow Ryan) during the promotional period have the chance of winning a random mystery prize from the €2,500 prize pool with 298 prizes available. Any bet with the required minimum bet value (€0.50) placed on participating games during the campaign period can trigger a chest with a random mystery prize from the prize pool. Each bet can win only 1 mystery prize. Only persons over 18 years of age are allowed to participate. The minimum bet required to participate is €0.50 or currency equivalent. Remaining number of prizes is updated every 60 seconds. Prizes will be credited as a bonus, and will need to be wagered once before becoming withdrawable. Players can win more than 1 mystery prize during the campaign. All cash race prizes will be automatically credited to the player’s balance in the respective account currency.